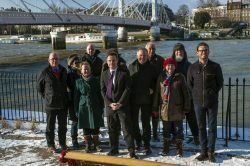 A new landscaped riverside garden has been created in Battersea Park in the latest stage of an ongoing series of improvements in the park worth £840,000. A few days ago The Promontory was officially opened – bringing a hitherto overlooked and unused area of the park back to life as part of a £100,000 scheme. Using a generous donation of £30,000 from local amenity group The Friends of Battersea Park, combined with £70,000 from the council, this formerly closed off area some 50 metres east of Albert Bridge has been transformed into an attractive landscaped garden, brought to life by renowned designer and landscape architect David Keary of Keary Design Associates. This previously unused and unkempt piece of land measuring some 50 square metres is now a landmark feature of the park, offering seating and unrivalled views of the Thames and in particular of Albert Bridge. David Keary’s design incorporates sculpted mounds, a meandering path around large trees with shade tolerant plants, while visitors in the spring will see a colourful array of shrubs, ferns and herbaceous perennials, along with a cluster of Japanese maples occupying the garden’s centrepiece. The promontory is one of several areas in Battersea Park to benefit from investment worth £840,000. Last summer a new £150,000 children’s playground was opened close to East Carriage Drive, while a new pedestrian entrance has been created between Chelsea and Rosary Gates, with associated landscaping, connecting with existing paths near the Millennium Arena. 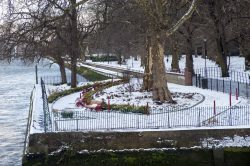 The park’s historic Victorian seating shelters have also been refurbished at a cost of £65,000, while £160,000 has been pledged towards the restoration of the Cascade fountain – an important and prominent historic landscape feature which have over time deteriorated and can no longer be used. The lion’s share of the funding was generated as a direct result of staging the Formula E electric motor car racing championships in the park for two years. 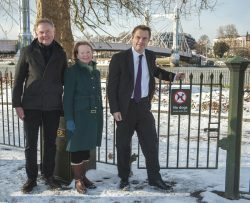 This raised £500,000 for park improvements, as well as another £2.5m for other frontline council services in Wandsworth. A further £250,000 has been levied from the developers of the neighbouring Battersea Wharf and Chelsea Bridge Wharf housing schemes. 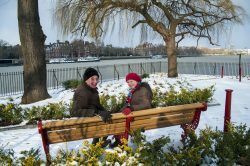 Environment spokesman Cllr Jonathan Cook said: “Battersea Park truly is one of London’s most popular and attractive open spaces. No other park in the capital offers so much to see, do and enjoy. Battersea Park covers some 200 acres and was opened by Queen Victoria in March 1858 having been created out of fields and marshland to create a place of healthy recreation for the huge numbers of people who had moved to London during the Industrial Revolution. Under the stewardship of the Greater London Council, the park became somewhat rundown in the 1970s and 80s and it was eventually taken over by Wandsworth in 1986 when the GLC was abolished. Since then, millions of pounds have been spent transforming it into today’s popular and much-loved open space.